Construction began on March 1st 1921 and, despite many setbacks, the section opened on 2nd February 1925. 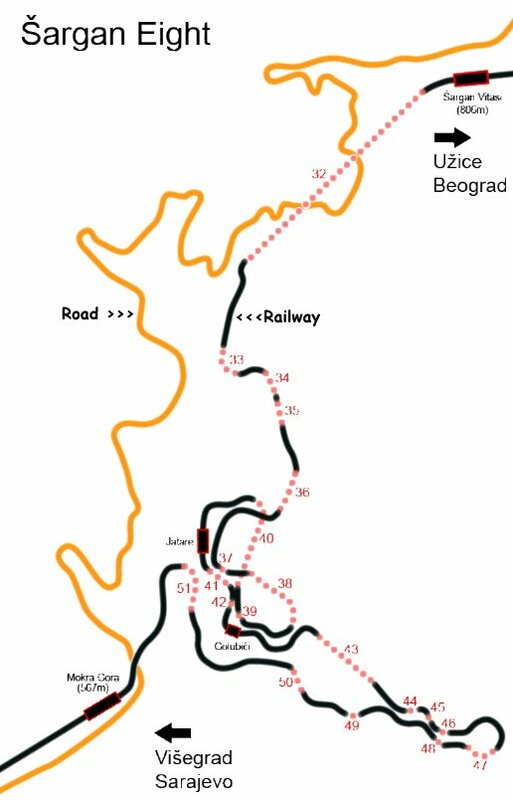 The final 40 Km missing link between Belgrade and Obrenovac opened on 30th October 1928 and a through 76 cm railway now existed over the 444 Km from Belgrade to Sarajevo. The climb over the Sargan Mountain was an engineering masterpiece. From Uzice to the summit the height difference was 240 metres. As the crow flies it was 3.5 Km but by rail it was 15.4 Km. The average gradient was 18% (1 in 55) and there were 20 tunnels including the summit tunnel of 1,666m. 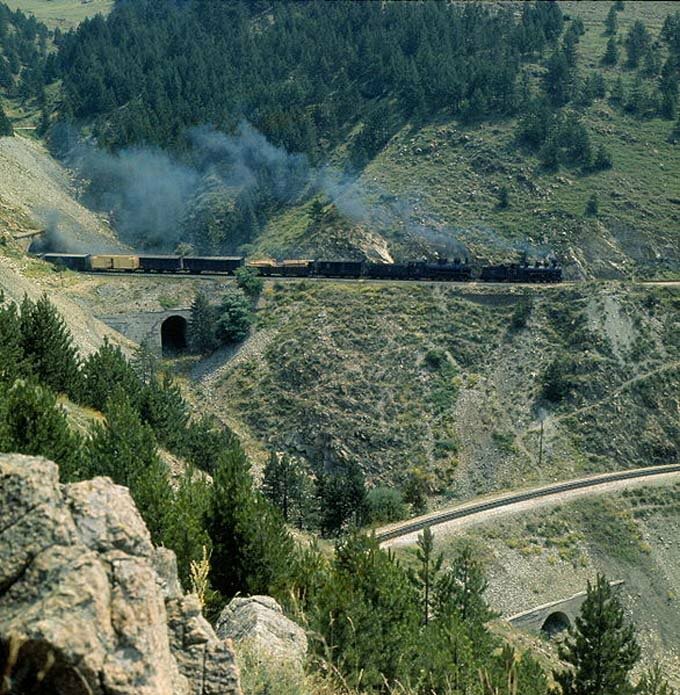 Two unaccredited photos of the line in use, taken before 1974. 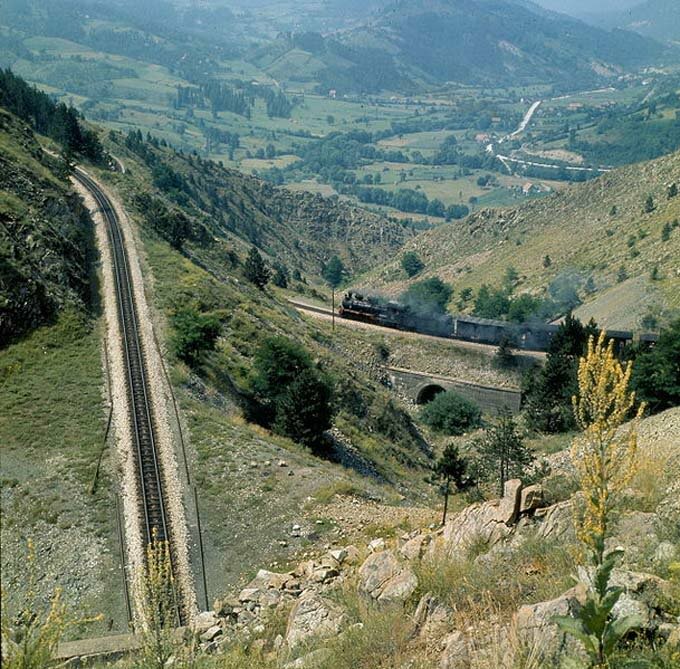 Just short of 50 years later, on February 28th 1974, the last train ran over the Sargan Mountain. 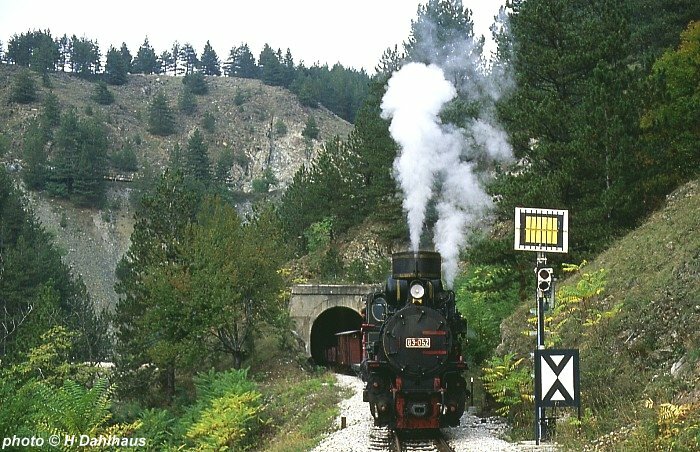 Fortunately the line between Mokra Gora and the top of Sargan Mountain has been revived, this is now the only section of the once great Yugoslav 760mm system to be preserved as a living railway. 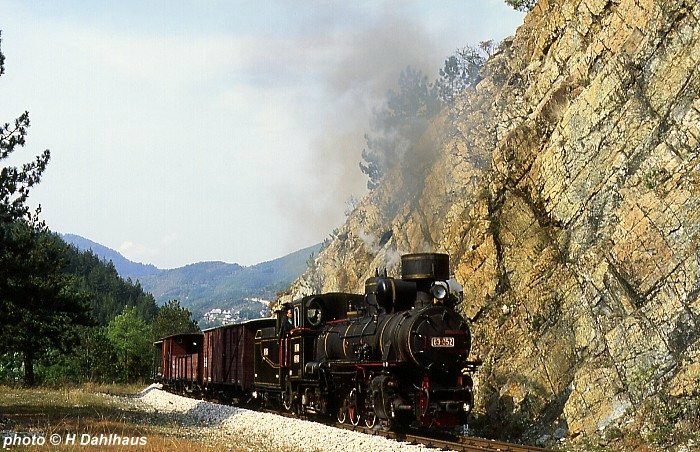 Trains currently run between Sargan Vitasi and Mokra Gora (Serbia). An extension to Visegrad in Bosnia was completed in 2010 but there does'nt yet appear to be a regular service. 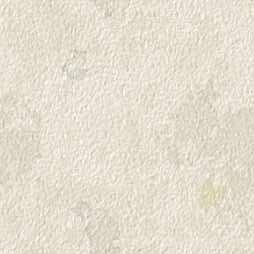 Thanks to Milan Suvajac for the use of the maps. Steam trains are presently hauled by Class 83 No. 83-052 (Jung 3534/1923) and 83-173 (DD 129/1949). It is also planned to restore 85-045 (SlBr 32/1940) and possibly other locos for use on the line in the future. When the extension to Visegrad is fully open the preserved section of railway will be 43Km (26.7 miles) long. 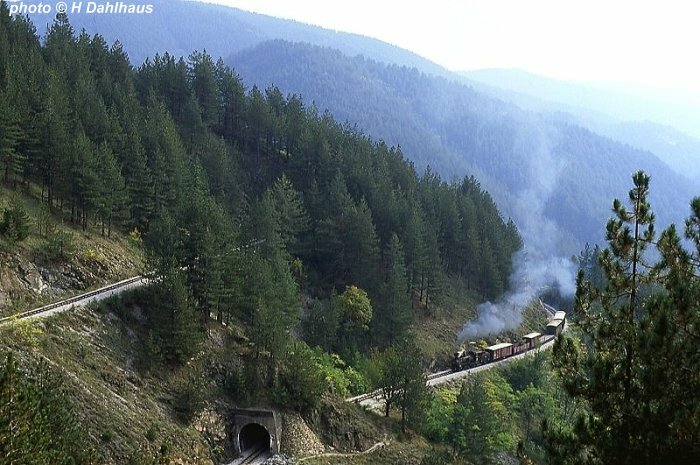 The photos below are by by Helmut Dahlhaus and were taken of a private charter goods train organised by German enthusiast Guenter Oczko on 6th October 2005. 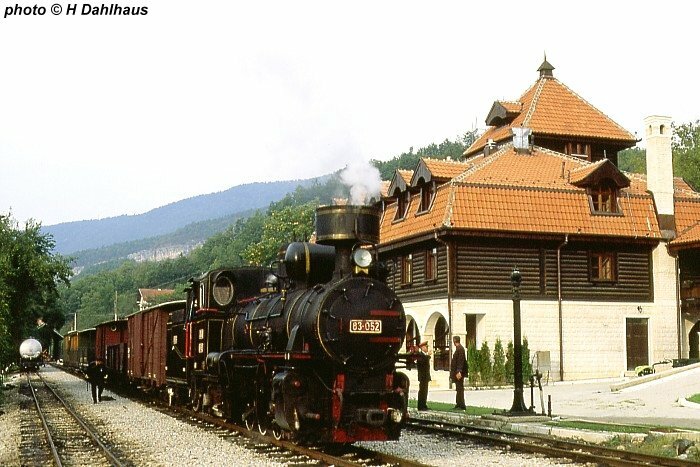 83-052 stands in the restored Mokra Gora station. 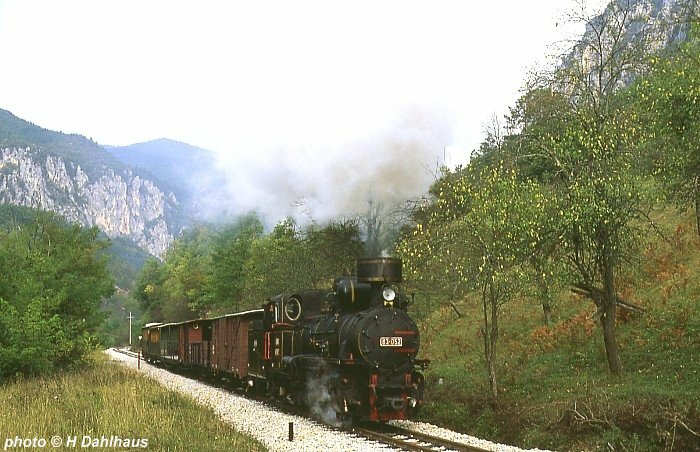 83-052 between Vardiste and Mokra Gora. 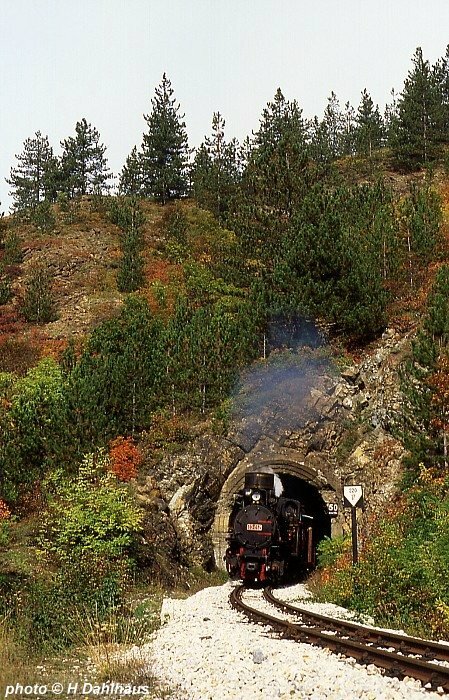 83-052 leaving one of the many tunnels on the climb to Sargan. 83-052, still climbing, near Jatare. Two levels of the line visible near the intermediate station of Jatare. Heading back down to Mokra Gora near Jatare. Another part of the line can be seen above on the left. 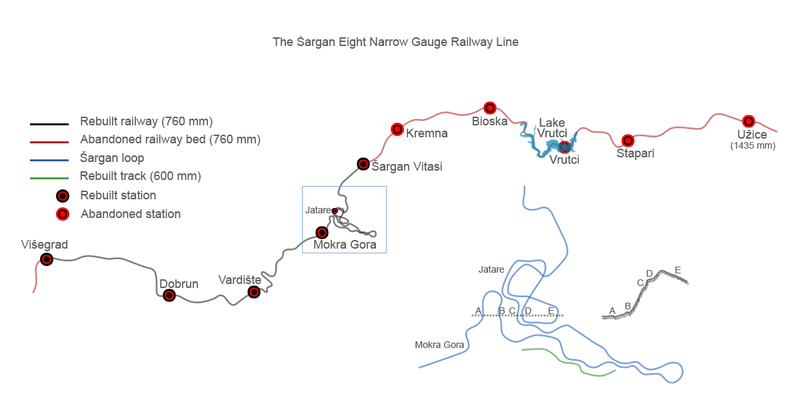 There is a triangle at Sargan allowing locos to be turned.